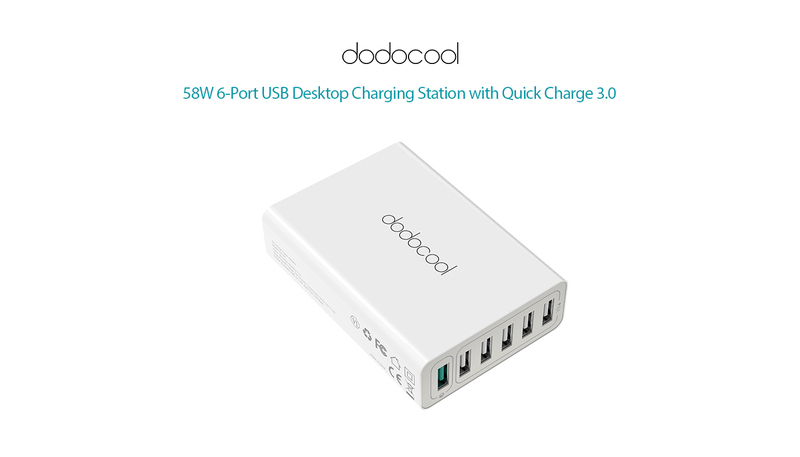 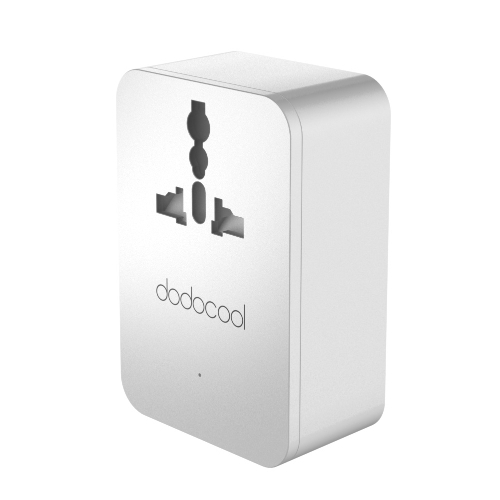 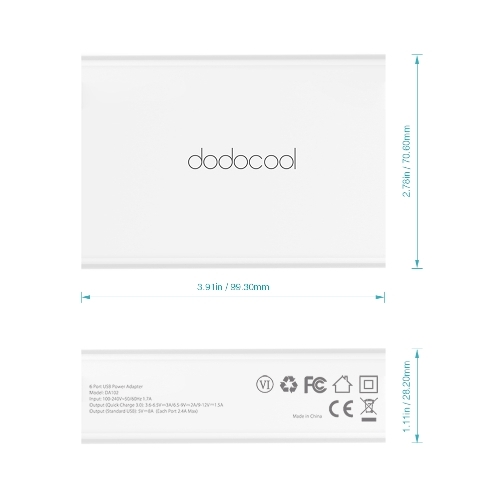 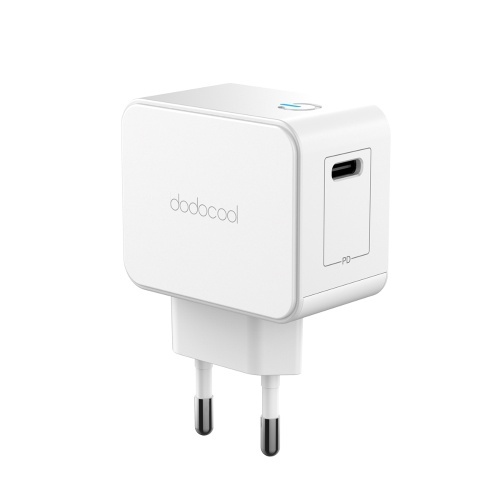 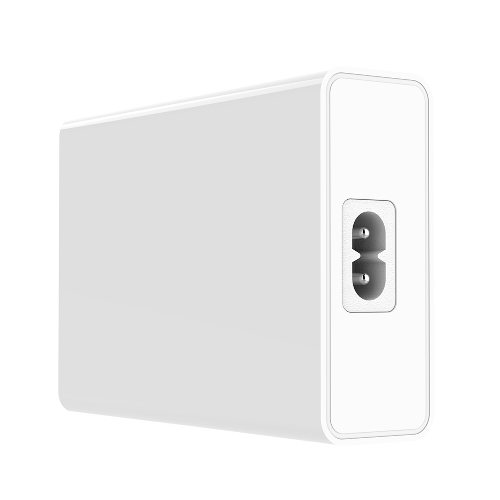 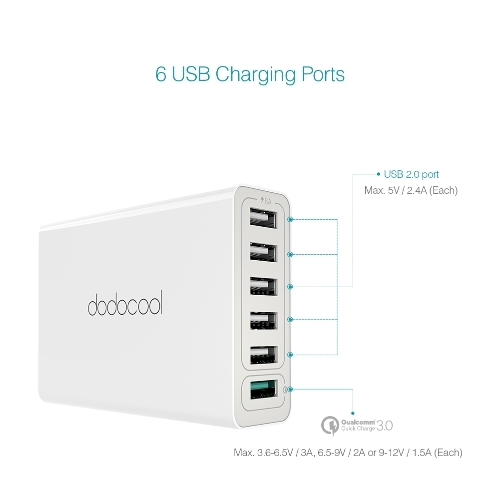 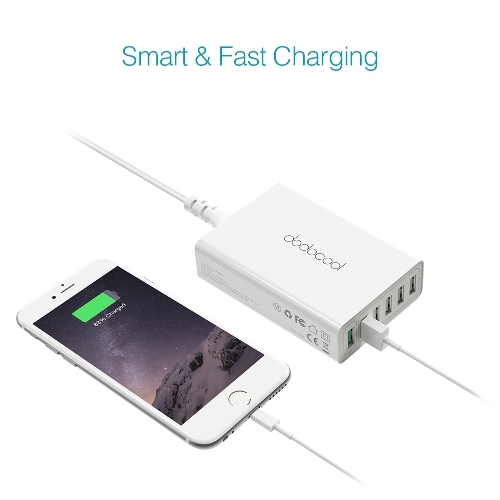 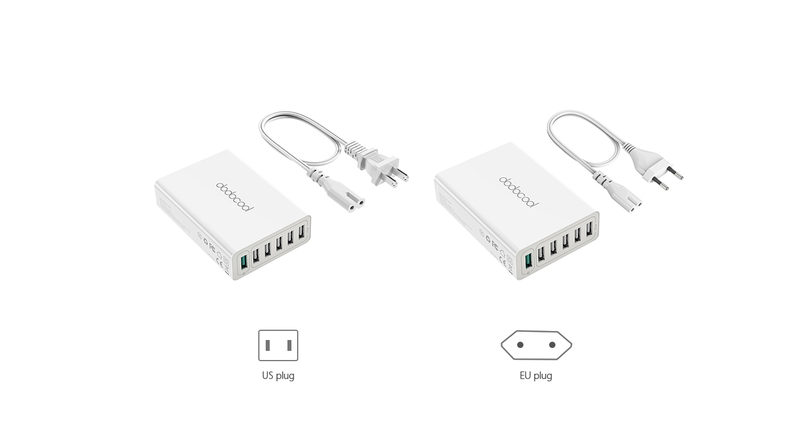 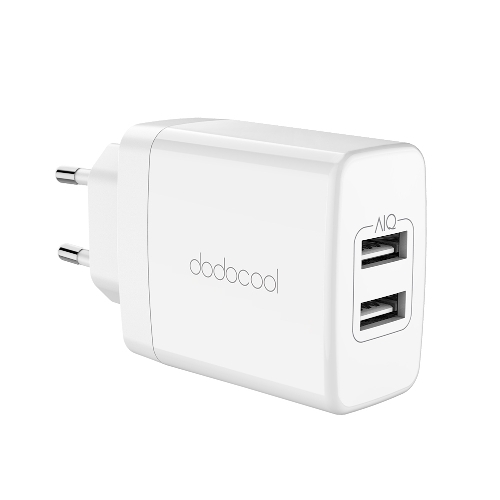 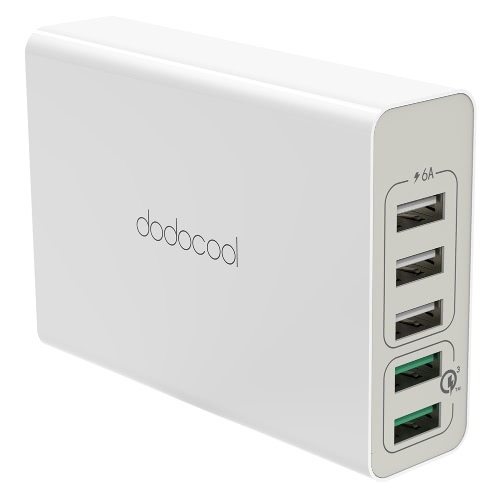 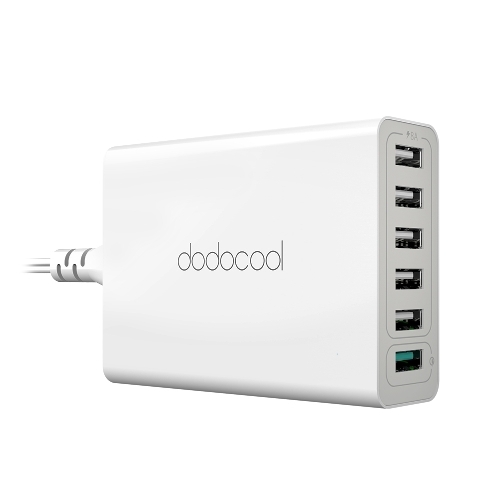 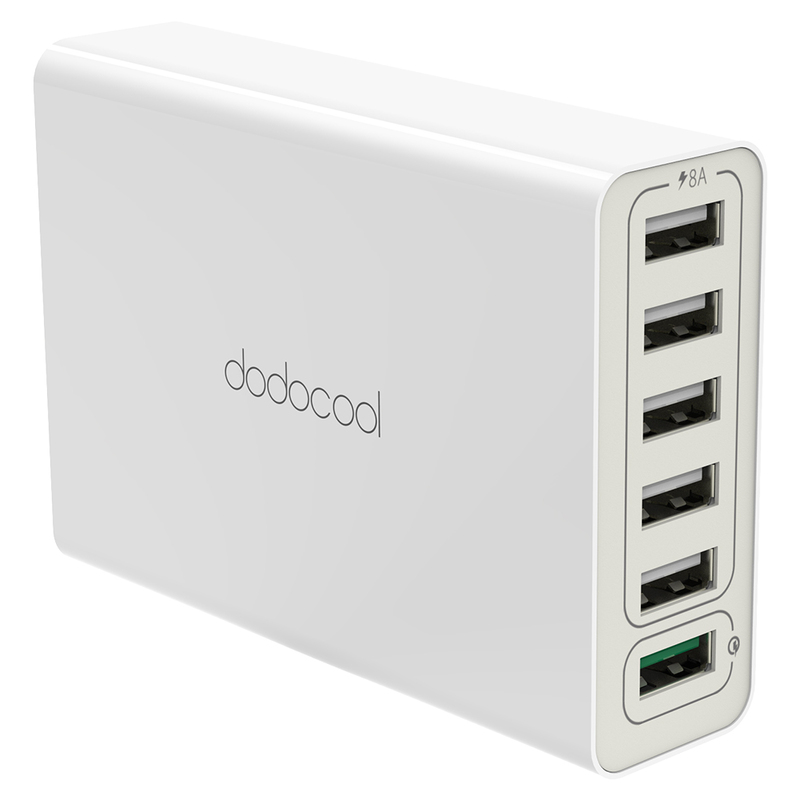 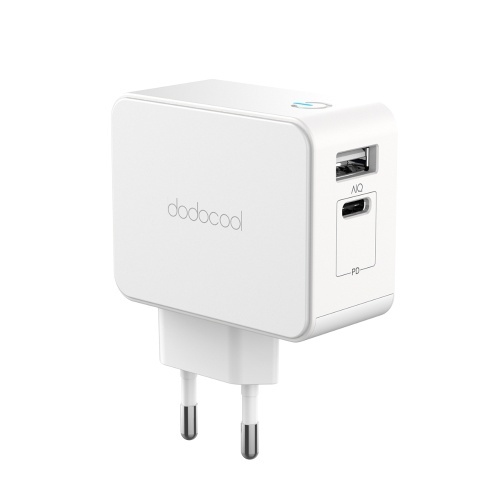 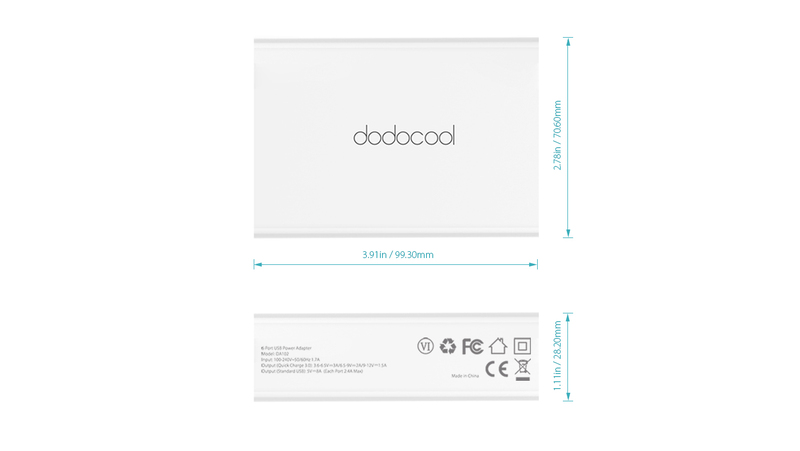 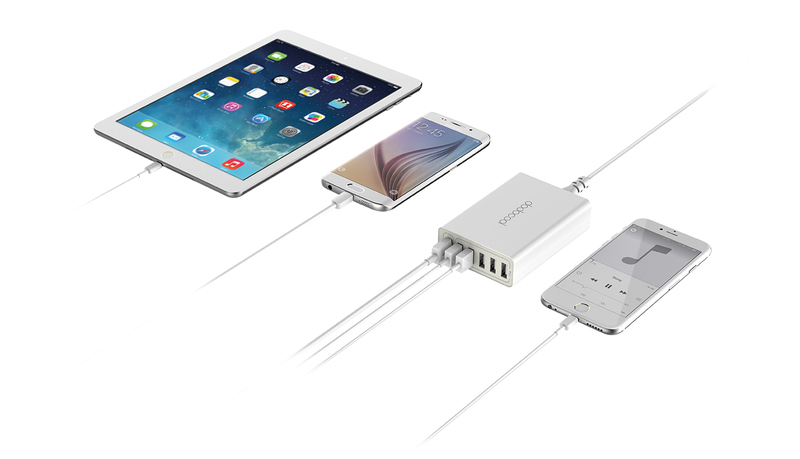 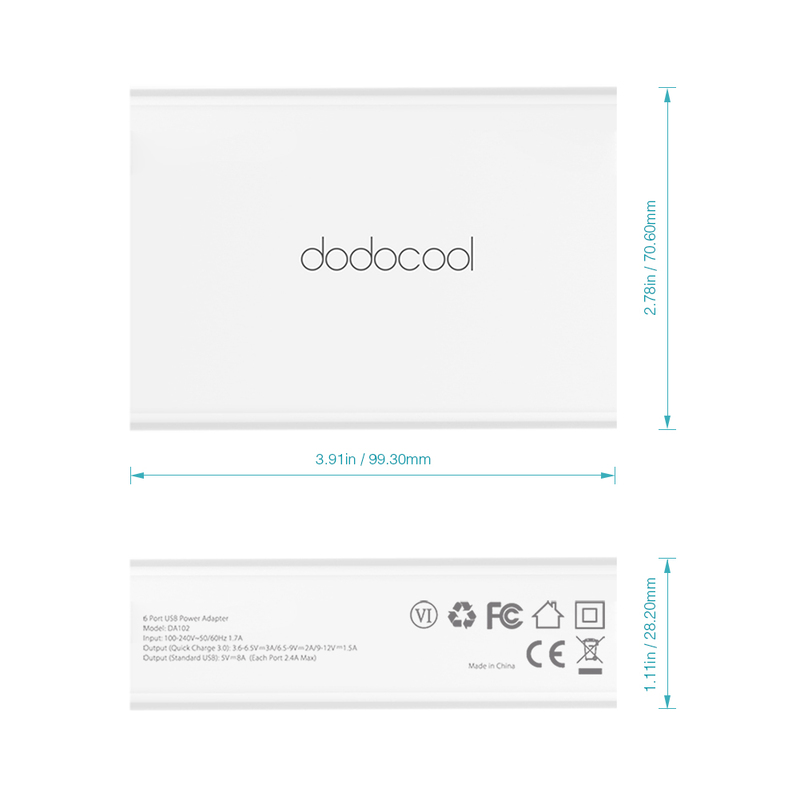 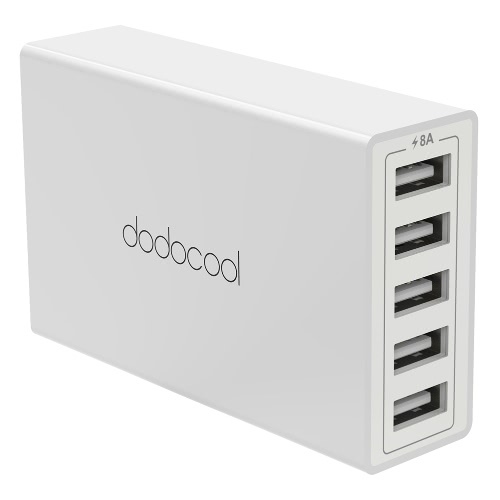 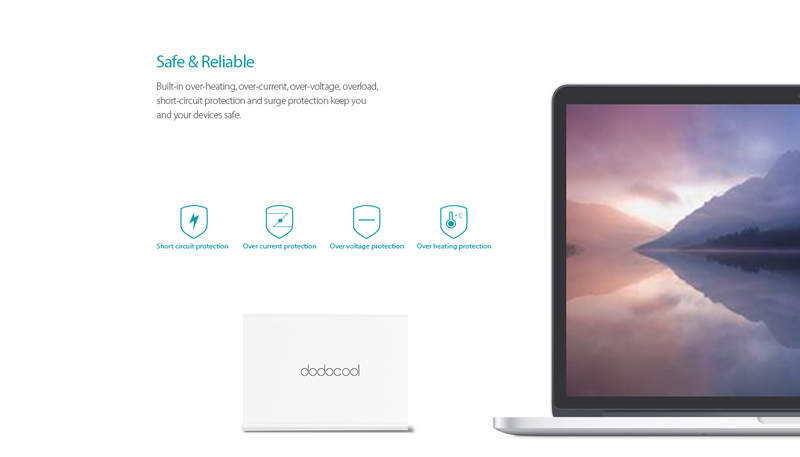 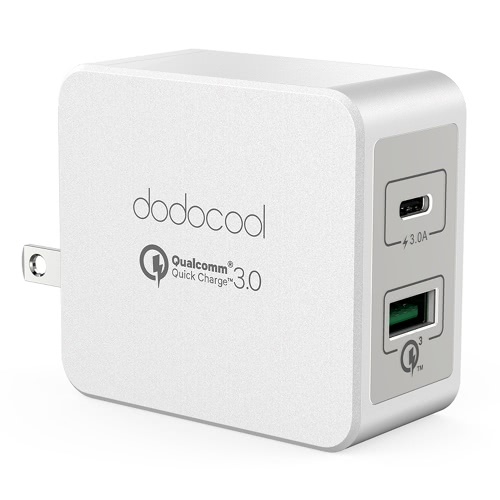 dodocool 6-Port USB Wall Charger enables you quickly charge up to 6 USB-powered devices simultaneously, with max. 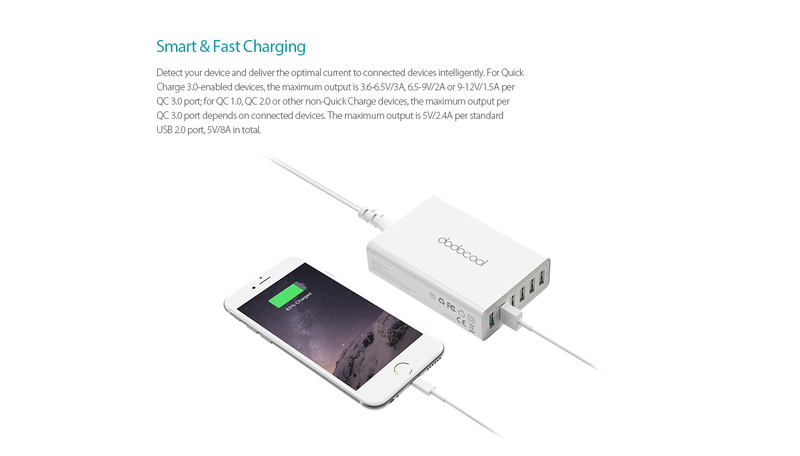 3.6-6.5V/3A, 6.5-9V/2A or 9-12V/1.5A output per port for Quick Charge 3.0-enabled USB devices and max. 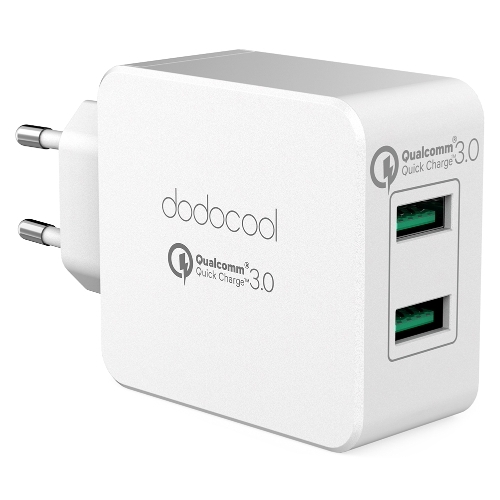 5V/2.4A output per port for non-Quick Charge 3.0 USB devices. 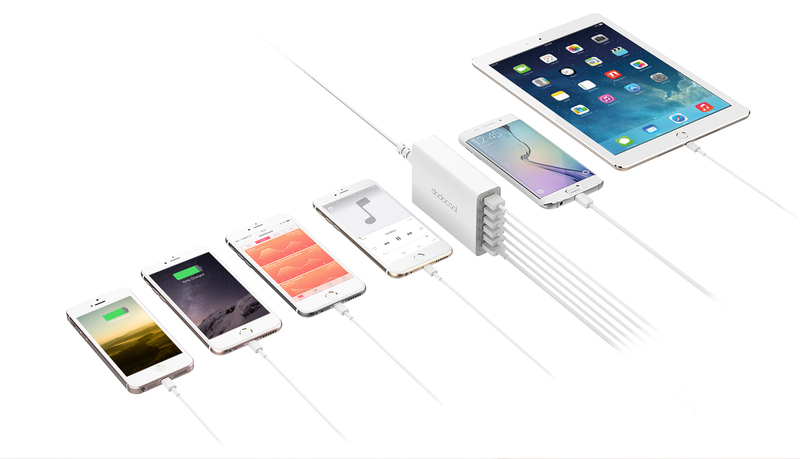 It's the must-have charging solution for home, office and on the go. 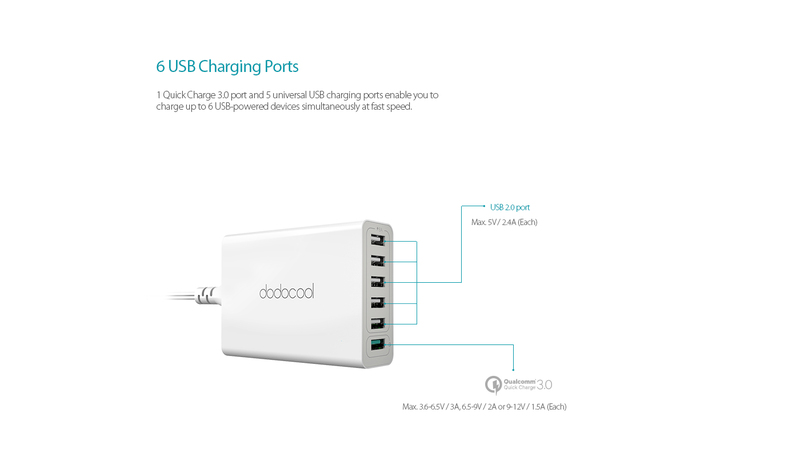 1 Quick Charge 3.0 port and 5 universal USB charging ports enable you to charge up to 6 USB-powered devices simultaneously at fast speed. 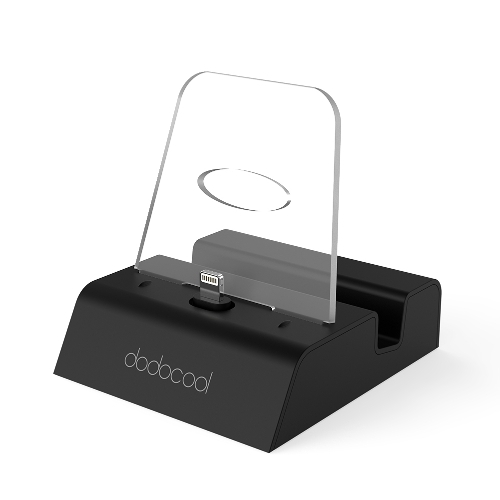 Adopt the latest and most efficient USB charging technology. 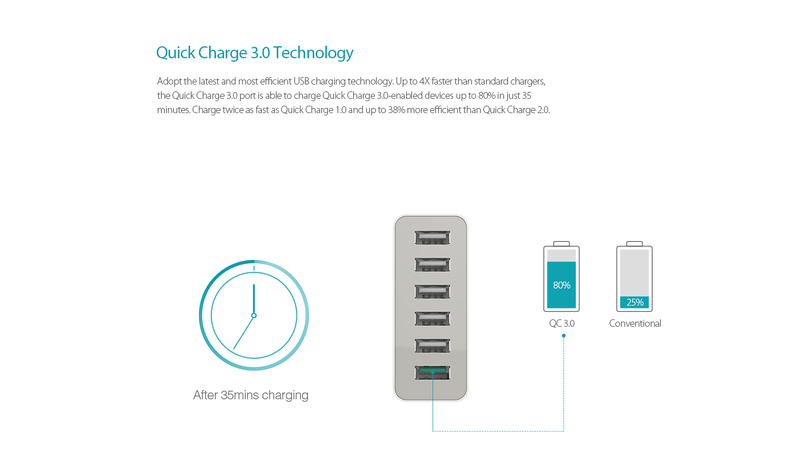 Up to 4X faster than standard chargers, the Quick Charge 3.0 port is able to charge Quick Charge 3.0-enabled devices up to 80% in just 35 minutes. 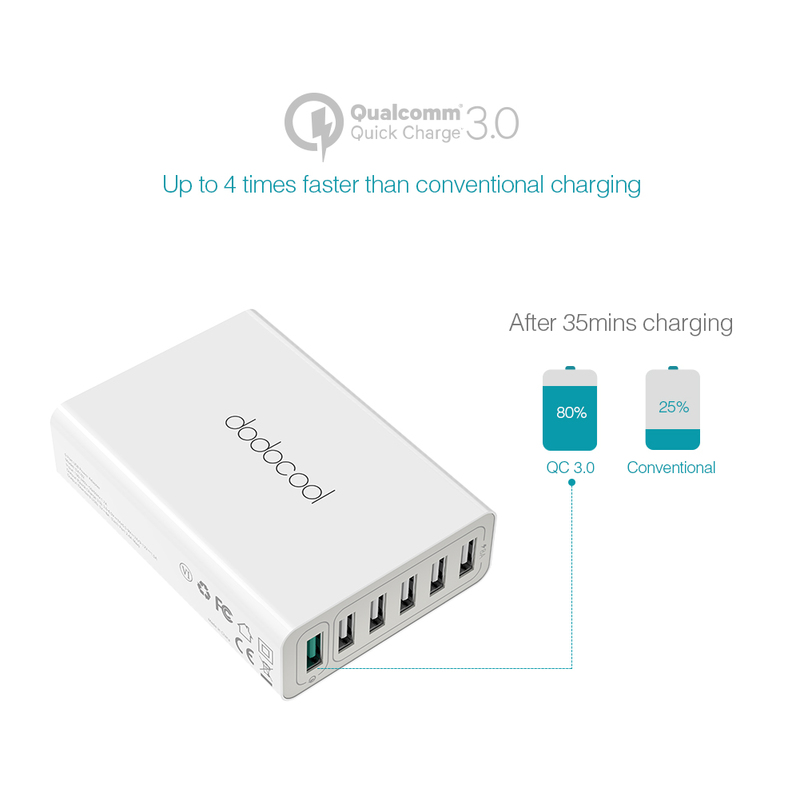 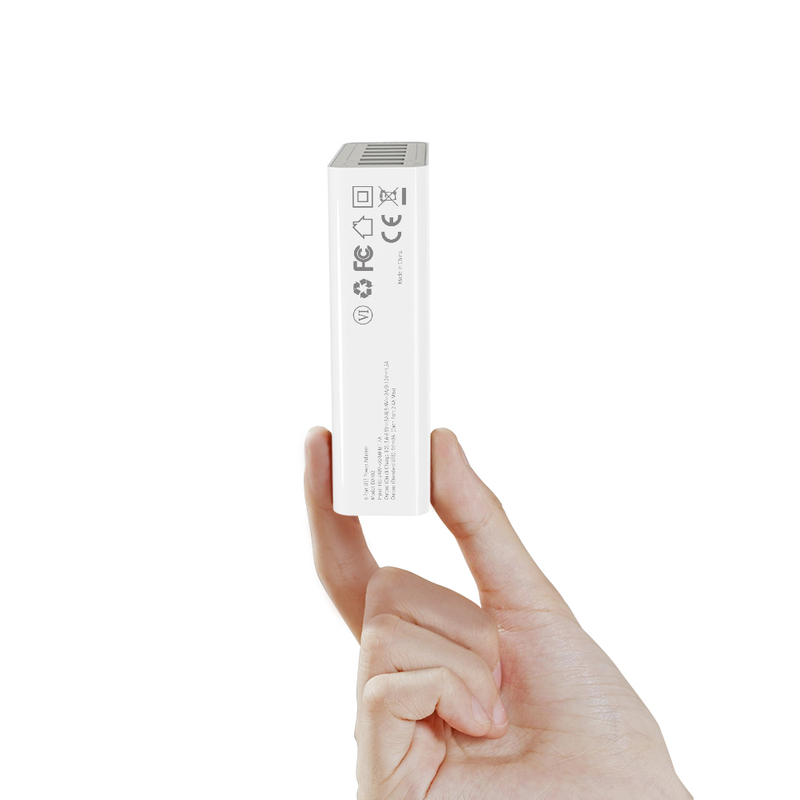 Charge twice as fast as Quick Charge 1.0 and up to 38% more efficient than Quick Charge 2.0. 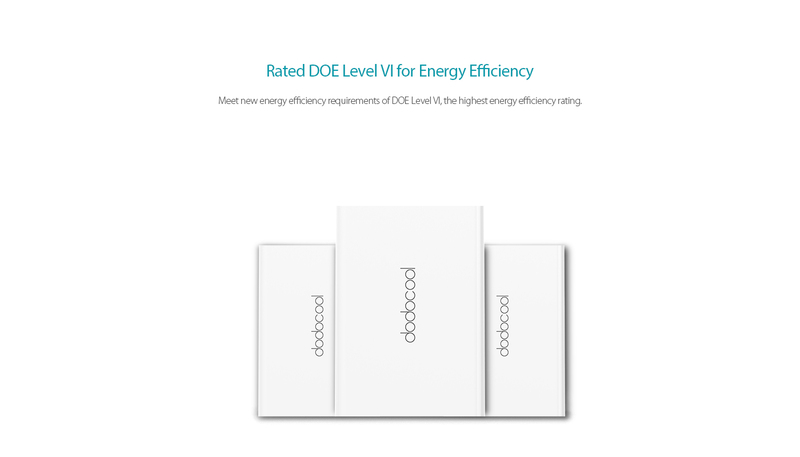 Detect your device and deliver the optimal current to connected devices intelligently. 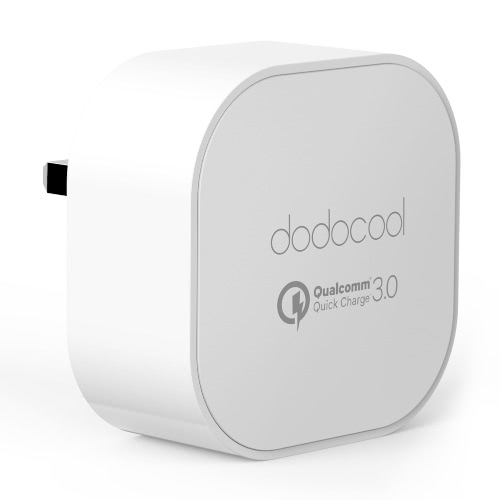 For Quick Charge 3.0-enabled devices, the maximum output is 3.6-6.5V/3A, 6.5-9V/2A or 9-12V/1.5A per QC 3.0 port; for QC1.0, QC2.0 or other non-Quick Charge devices, the maximum output per QC 3.0 port depends on connected devices. 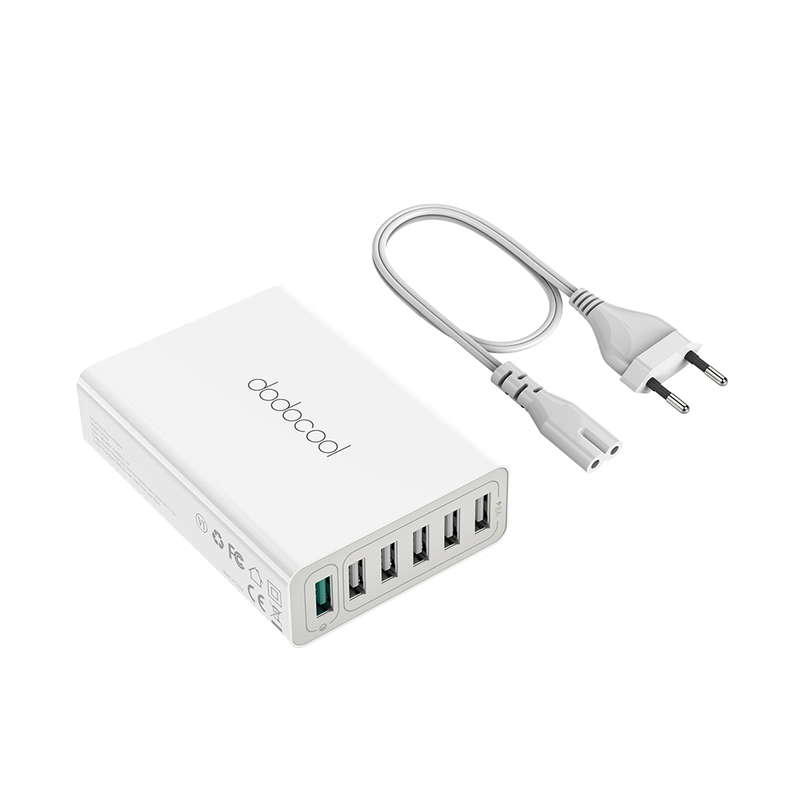 The maximum output is 5V/2.4A per standard USB port, 5V/8A in total. 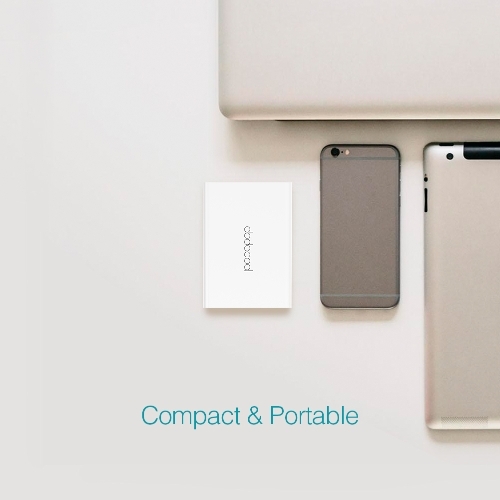 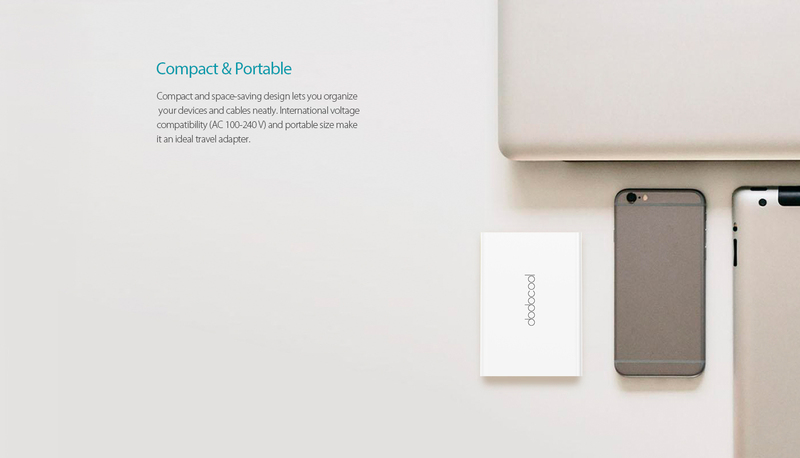 Compact and space-saving design lets you organize your devices and cables neatly. 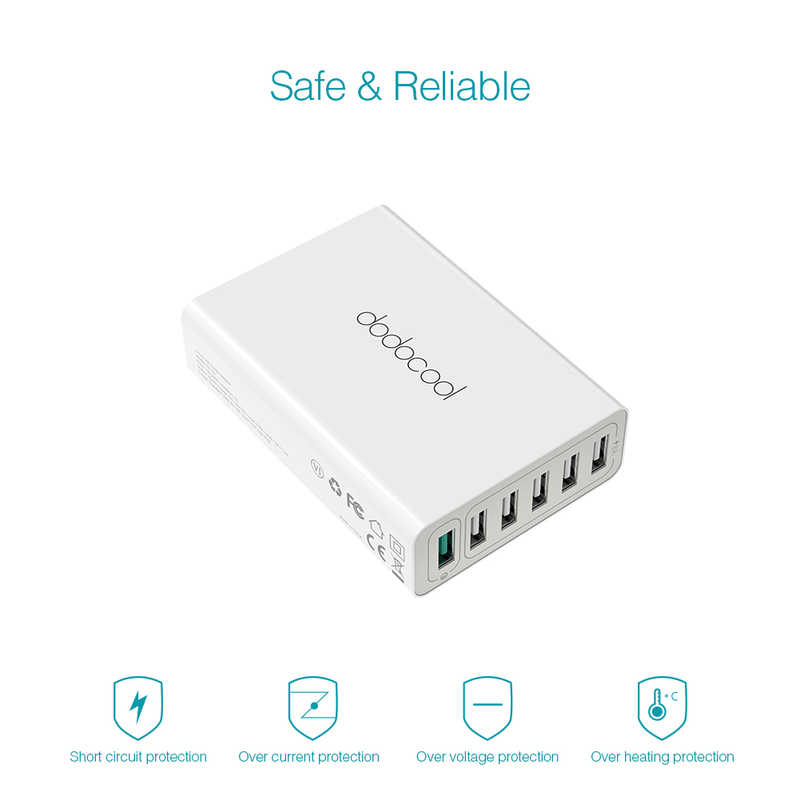 International voltage compatibility (AC 100-240 V) and portable size make it an ideal travel adapter. 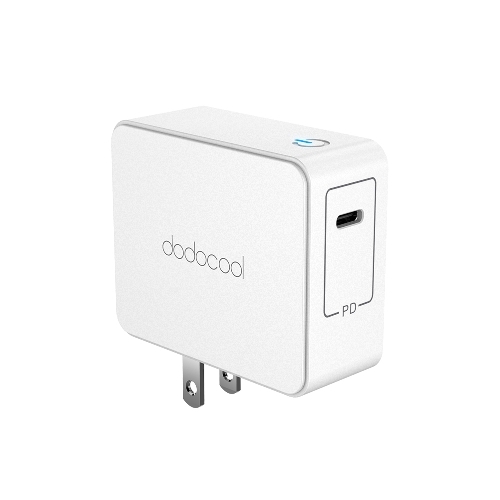 A detachable 1.5m AC power cord is provided. 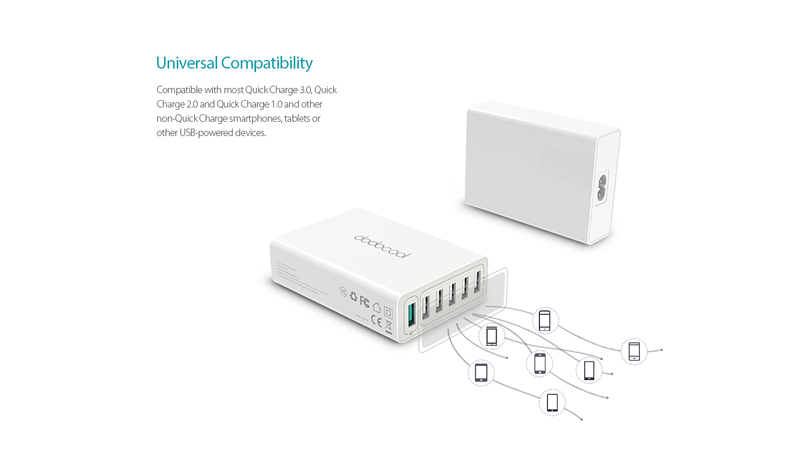 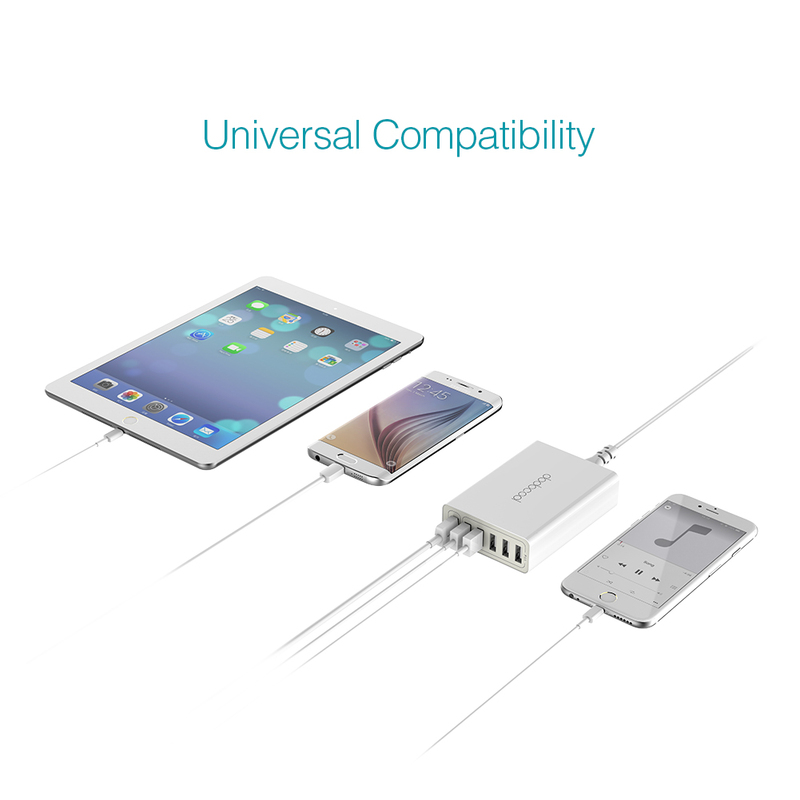 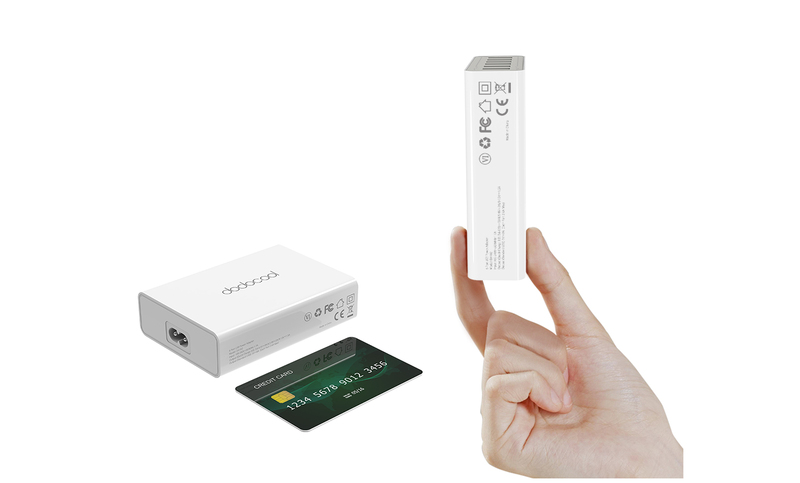 Compatible with most Quick Charge 3.0, Quick Charge 2.0 and Quick Charge 1.0 and other non-Quick Charge smartphones, tablets or other USB-powered devices.